Description:This was the view up Market Square towards the Angel public house on Town Road. 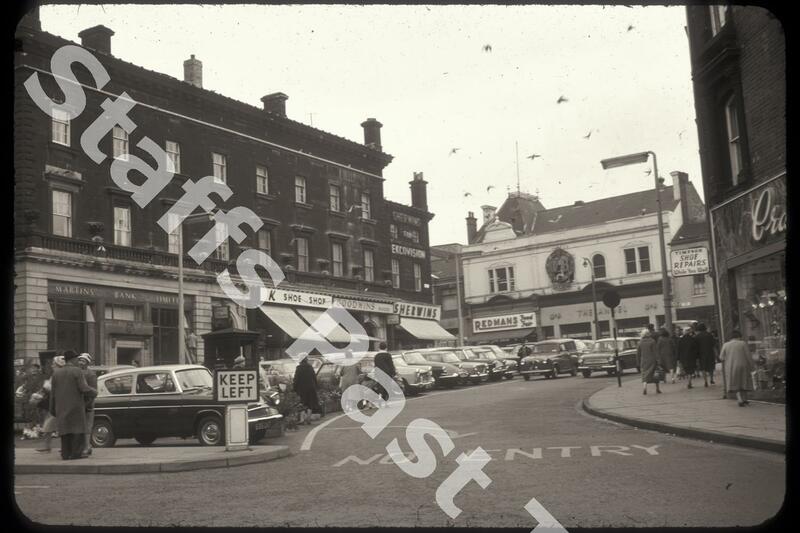 In 1963 the square hadn't been pedestrianised and was a popular car parking area. 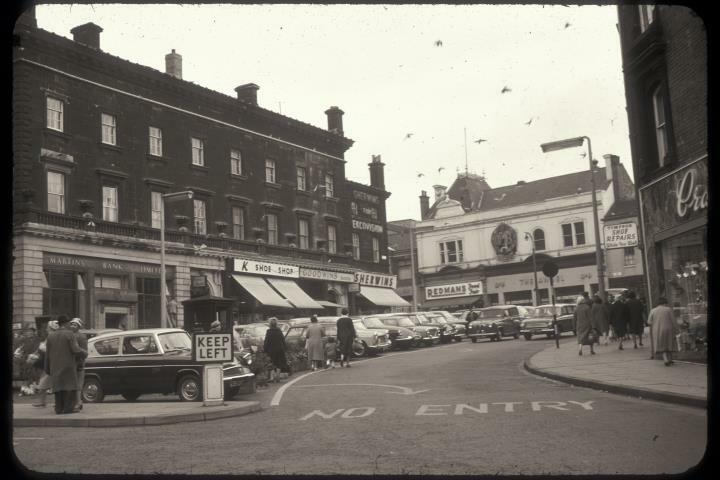 On the right, where the Potteries Shopping Centre stands, is Martins Bank (bought by Barclay's Bank in 1969) and between them and the K's Shoes shop the entrance to Hanley Public Market is just visible. Further up is Goodwin's Bakers and then Sherwin's a music store which also sold radios and televisons (see the Ekcovision advert). These stores disappeared and the indoor market gained a new entrance with the building of the Potteries Shopping Centre in 1987-88. On Town Road is the Angel public house, which started life as The Angel Restaurant and Wine Store in 1893 "a handsomely fitted up establishment, where luncheons, dinners, suppers and all refreshments are served in first-class style." By 1963, the left hand side had become Redman's Food Fare. The building to the right of the Angel is The Grapes, a "Bass Only" public house demolished in 1970. Most of the old public house has been rebuilt and occupied by a bank.